Domain scamming--don't pay the bill! Domain scamming–don’t pay the bill! During some downtime at work today, I ran into a scam I hadn’t heard of before–having to do with domain listing. It’s an excellent reminder of the importance of paying attention to bills and, well, anything that purports to be from a company we’re doing business with. If you own your domain, you may receive a bill from either Domain Listing Service Corp or Internet Listing Service Corp charging you some amount around $70 for reregistering it. At first, you might worry that it’s a catch in your original agreement with GoDaddy or Dreamhost or whoever registered your ISP. But it’s not, it’s the classic “pay this bill and sign up for this program” scam. There’s a little fine print which explains that it’s actually a promotion, not a bill–but you have to wonder if some people pay it without thinking. 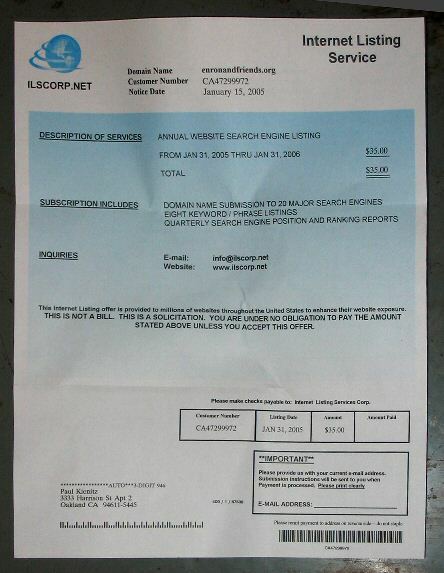 Paul Kienitz posted a picture of the phony “bill” he got from ILS corp.
There’s an interesting conversation about the company over at lesjones.com, which began in 2004 and has continued up ’till a couple days ago. If you don’t remember who you bought your domain through (and maybe it wasn’t the people you’re using to host it), double-check before you pay any bills! Somehow they must get people to do this, otherwise why would it still be going on after 4 years? Liberty Names does the same thing. If you look closely you will see it is an advertisement or promotion as you called it. I went ahead and transfered one of my domains to them, but after about a year, I went ahead and transfered it back to register.com, so that I could have control of the GNS settings for that domain. Truely a scam! Just received an offer for their ‘service’ a few days ago. Yet another reason to pay the extra few dollars to keep your website ‘whois’ info private!